Editor Erin Byrne had the content for this book, as well as several images she wanted to use on the cover. The Book Alchemist designed the front and back covers based on the supplied images. Jim also designed the inside pages, and prepared files for release to the printer. 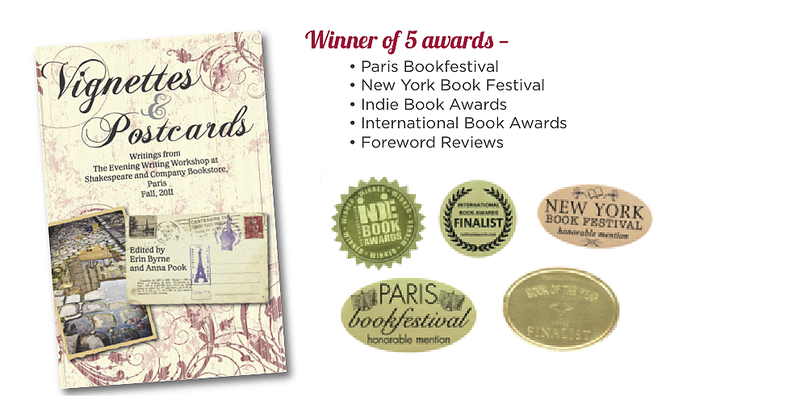 The book has won awards from the New York Book Festival, International Book Awards, the Paris Book Festival, Indie Book Awards, and Foreword Review. Now in its third printing, this 114-page book showcases the work 22 writers. Vignettes & Postcards is an exquisite collection of stories by writers from all over the world who gathered at Shakespeare & Company Bookstore in the fall of 2011. Since its doors opened in 1951, writers and artists have come to Shakespeare & Company from every corner of the globe for sanctuary, community, and inspiration. Anyone who has spent time there—from the thousands of tumbleweeds who have worked there in exchange for a place to stay to the many famous authors who have at one point called it home—knows that something other happens when writers gather there and begin to create. These stories shimmer with this quality. Vignettes & Postcards: Writings from The Evening Writing Workshop at Shakespeare & Company Bookstore, Paris, Fall 2011 presents twenty-six stories in a variety of genres—short fiction, personal essay, interview, travel, and poetry. The book is an anthology from the workshop “Leaping Into the Void,” taught by award-winning writer Erin Byrne. Taste rough grains of cinnamon that scratch the tip of your tongue; feel the weight of a pen in your hand during a moment of pure inspiration; hear the pealing of bells from high up on an Italian hillside; consider the secret rebellion of fashion; and find yourself inside the dragon dream of Sylvia Plath. Tumbleweed or not, every reader who opens its pages will savor Vignettes & Postcards.